Available on all media: blueline, blackline, mylar, or sepia. Plotting of your CAD drawing onto bond, vellum or drafting film. Send us your cad file by email. 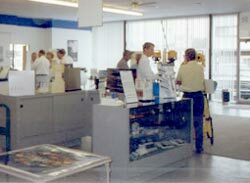 Large format (36" wide) prints with enlargements or reductions, on a large variety of media: vellum, 4mil film, or bond. We print from most computer files, with equipment to serve Mac and PC formats. We print your files in either full Color or B/W. Our art department has the equipment to do your job right, and can design to your requirements. 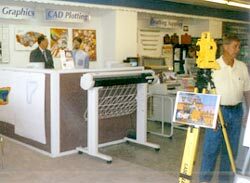 Equipped with a wide format color scanner to scan images from thumbnail up to 54" wide by any reasonable length. Scanning formats consist of Photoshop, eps, tiff, jpeg,bmp, gif, pict, and pcx. InkJet Plotter Technology allows us to make your poster up to 60" wide by 1200" long at 600 dpi. The inkjet plotter has the ability to print near photo-realistic prints onto a variety of media: photographic-quality papers, presentation paper, translite (back-lit material), adhesive vinyl, even prints on to canvas for the artist in all of us . Call now and turn your color prints into ART. Available Now - Get all your files or scanned images put on cds, the safest and most efficicient way to retrieve important information. Greatly enhance and protect your finished piece by Mounting and Laminating up to 60". To complete the poster or photo enlargement consider one of two framing possibilities.